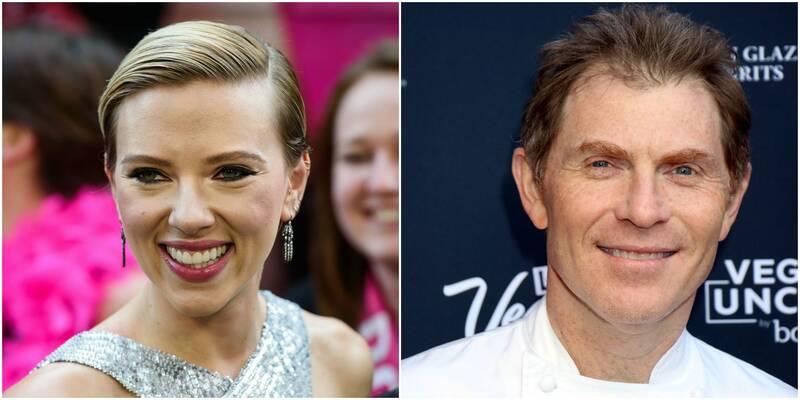 Are Scarlett Johansson & Bobby Flay Dating? Scarlett Johansson and Bobby Flay were photographed leaving a New York City restaurant together this week, leading to speculation that the pair could be cooking up a romance. It’s an otherwise unassuming Sunday evening when a man and a woman emerge from Manhattan’s Sushi Nakazawa in the West Village. They seem to be in good spirits (Us Weekly reports they were “all smiles”). From the outside looking in, it would be easy to believe that the pair shared a romantic connection. And, hey, it’s entirely in the realm of possibility that a man and a woman can share a purely platonic meal together, right? Of course, it’s also within the realm of possibility that Johansson’s rep is downplaying what could very well be the beginning stages of something decidedly less platonic. The timing is right, given that both are currently single. In September, Johansson finalized her divorce from French journalist Romain Dauriac, with whom she shares a 3-year-old daughter. Flay’s divorce from actress Stephanie March is much less recent, having been finalized in 2015. Although both have reportedly dated since their respective splits, neither appears to be in a committed relationship at this time.